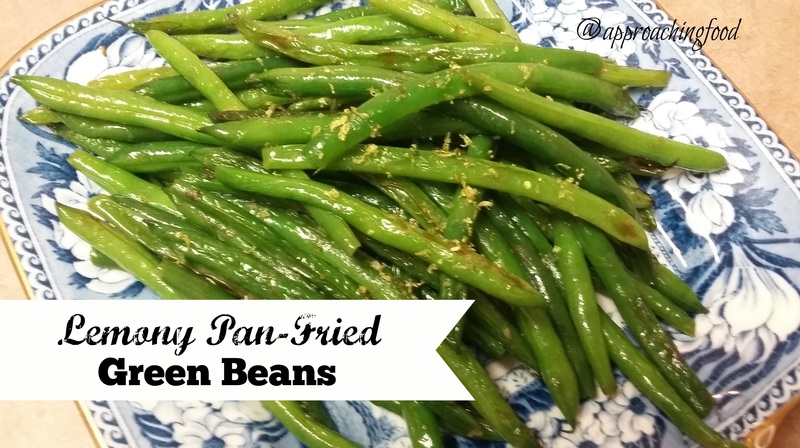 Lemony Pan-Fried Green Beans: A Super-Quick and Easy Side Dish! A taste of spring in the winter months! I love green beans. They’re fresh, they’re green, they have a satisfying, crisp crunch to them, they’re full of protein, and hey, they’re healthy! So I thought I’d make a green bean dish today: Lemony Pan-Fried Green Beans. They’re a taste of spring (or summer) in this cold February month. With only three ingredients, this dish goes from fridge to table in 10 minutes…including prep time! Yes, it’s that fast! Who doesn’t want a quick and fresh side dish that is full of flavour? Heat oil in a frying pan. Wash green beans and cut off ends. Toss green beans into the frying pan, along with 1 tsp. of lemon zest. Put a lid on the pan (otherwise hot oil will splash out, especially when you put in the freshly washed green beans). Fry over medium-high heat for 5 minutes, or until the beans are cooked to your desired preference. Put beans on a serving plate and sprinkle remaining lemon zest on top. Et voila, you’re done! This is a vegan recipe, but to be honest, I think it would be even better if it was pan-fried in butter. Just think how delicious that would be! That said, as healthy as green beans and lemon zest are, the fact that oil (or butter) is used, means that this is not as healthy as steamed beans would be. But hey, sometimes it’s nice to switch things up a bit! Speaking of switching things up, I was reading an article about mixing brownies and croissants together. Sounded…interesting. But now I’m thinking of the different types of mashups I could make. Brownies and bread pudding? Too rich, I think. Hmm. Brownies and…what? Any suggestions? Let me know in the comments! Next Post: Blue Velvet Pancakes, or some sort of Brownie Mashup. Preferences? Linking Up at Meal Plan Monday and at Happiness is Homemade! And at Full Plate Thursday! Plus, at Foodie Friday! This entry was posted in Vegetarian Side Dishes on February 18, 2018 by Margaret. I’m taking a meal tonight to a friend who just had surgery. I bought fresh green beans as a side dish but hadn’t decided how I would prepare them. Now I know! Yay, glad you’ll be trying the recipe! I have a bunch of green beans in the fridge myself, so I think I’ll make up another batch too! I love lemon with Green Beans, gives such a fresh flavor! Your post is awesome and thanks so much for sharing it with us at Full Plate Thursday. Have a great week and come back to see us real soon! This recipe looked so good it gave me a craving for fresh green beans in the middle of winter – I decided to splurge at the grocery. The fresh beans for sale were shriveled, pitiful and overpriced. I walked past. This recipe will be saved until summer since my choices at the grocery stores are limited. However, now I can’t stop craving green beans. My “amazing” produce is not very impressive right now. I have planted my seeds inside for an early start and NOTHING has sprouted! NOTHING!!! It is driving me crazy. I keep walking by and picking up my magnifying glass to look. Only an uninvited weed has sprouted and it just laughed at me. I’ve seen Nigella use croissants in a bread pudding recipe – as for brownies – they could be chopped up a bit and mixed with berries & ice-cream or perhaps as the base of of cheesecake or what about layering them with chocolate mouse & fruit & cream – all in a beautiful glass parfait glass or even a small mason jar so the layers show through? Croissants in a bread pudding sounds decadent! I think I’d like to try making almond croissants with leftover croissants sometime. As for brownies…well, everything is better with brownies! And I think your idea of a mason jar parfait is lovely!